Damasteel® is the best performing stainless Damascus steel in the world using the latest gas-atomized PM technology with very high cleanliness.It has incomparable toughness and strength combined with excellent edge retention and corrosion resistance. This allows for a very user friendly Damascus patterned steel that is made to be abused. We forge to order and your high standards on design and function is our priority. Damasteel’s stainless Damascus patterned steel, Damacore® DC18N is a powder metallurgy-based steel with three different alloys. The center, the core consists of N11X™, a high nitrogen steel with distinctive properties combining outstanding corrosion resistance with edge sharpness, wear resistance, strength and ductility. The Damascus patterned outer layers consists of RWL34™ and PMC27™. They are both variants of martensitic stainless steel with a minimum of 13 percent chromium content. They have been proven very suitable as a knife material, for long cherished in Damasteel DS93X™ martensitic Damascus patterned steel. 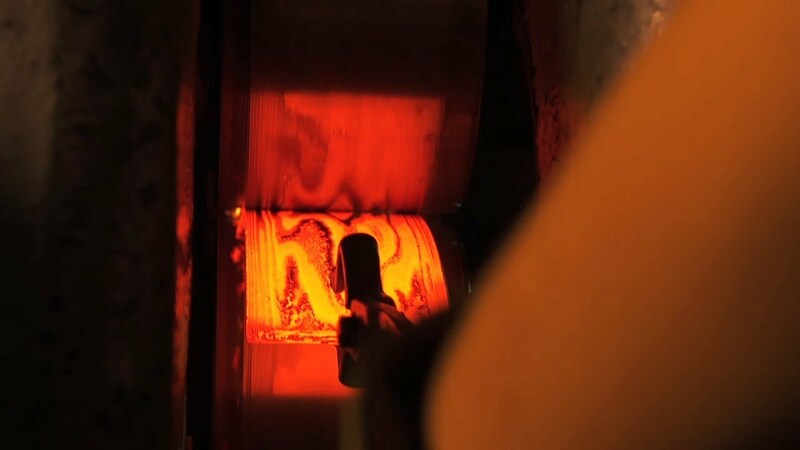 The three alloys combined in Damasteel’s process gives the Damacore® DC18N unique and exceptional properties. This provides an ultimate blend of technology advanced knife available. The story behind the name: “Baldur is the God of light and purity and all the Gods praise him for his beauty. Baldur is so bright that light shines from him. He is so beautiful that even the most beautiful flowers bows before him, as he walks past them. Damasteel’s stainless Damascus patterned steel, Damacore® DC18N is a powder metallurgy-based steel with three different alloys. The center, the core consists of N11X™, a high nitrogen steel with distinctive properties combining outstanding corrosion resistance with edge sharpness & strength. Damasteel® Chef Invitational is an exclusive chef knife show with world class knife makers. Custom made kitchen knives of stainless Damascus patterned steel is made by some of the most talented craftsmen from around the world. May 20 in Chicago.